An impromptu magic trick can impress friends, family and business associates. To do this, you don't need anything expensive. In fact, in my view, you can spend less than £9.00 and have a thumb tip, silk and a booklet which will show you many 'disappearing' tricks which can be mastered very quickly. "If you come and pick it up from my office in Olney it will cost you £5.95 as you'll save on post and package." The video below is me doing a couple of tricks with the thumb tip. Many people I know just carry the thumb tip and silk around with them so that at any appropriate moment they can do the trick and you would be amazed at the interest you will get. The vast majority of people just do not know how it's done. 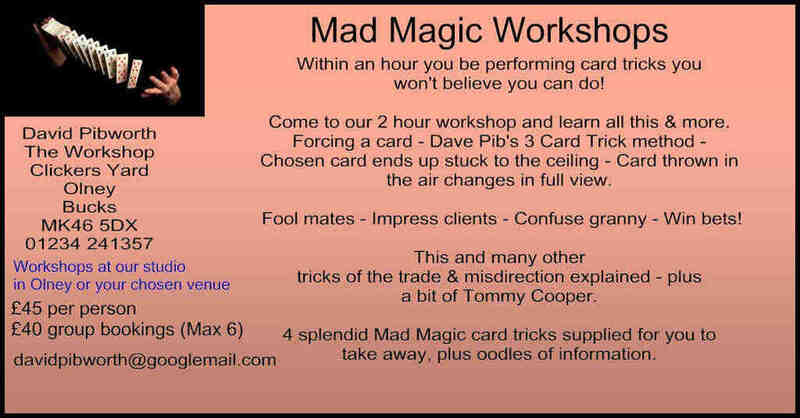 Of course, you can come and have a magic workshop at Olney, or I will travel to you and I'll explain the subtleties of doing this trick, although it is described fully in the booklet. Obviously, if you come to a workshop with me you will also go home with other easy to do tricks, and all of them are immediate. I will teach you the best way to make someone pick the card you want. It can be taught in, well, minutes to be honest. "The magic colouring book as used by Eddie Redmayne on Graham Norton's show is also part of the workshop package." So do have a look at my website, Magic & More. I'm now doing corporate workshops with up to 10 people (which is 2 hours) and all materials are supplied. It's amazing how many people you can cheer up fairly quickly, and indeed how it can just make you stand out in a crowd and be remembered as "the person who can do magic" as they say. If you'd like to learn how to perform impromptu magic, book a workshop with me or come and collect any magic tricks from Olney, give me a call on 01234 241357 or click here to ping me an email and let's see how I can help you.